I’m planning on seeing the next two without question. I may be re-considering this, although I will (in the end) most likely see There and Back Again next year. There were some parts that dragged on too long (more on that below) and some superfluous material,… My word, this year this goes double. but, overall, it kept my attention, …snooore…Oh, I’m sorry, nodded off there…uh, yeah, not so much this year. Legolas: His presence in the movie was fine. After all, the Elvenking is his father; Legolas is a prince of the Woodland Realm. I’ll get into misgivings about Legolas below. Tauriel: Believe it or not I was okay with Jackson’s made-up character. She conveyed the difference between the ruling Sindarin family and the Silvan Elf population quite nicely. The Spiders: The evil insects and Bilbo’s initial encounter were spot on. I found it interesting that Bilbo could only understand the spider’s language after he put on the Ring. Laketown: The town itself was an Alan Lee/John Howe art-piece come to life. Bilbo’s initial encounter with Smaug: The first few minutes were great. Languages: As usual, I enjoyed hearing faux Tolkien languages (or maybe neo-Tolkien languages) used on screen. For some misgivings, see below. Bard: The Lake-man actually comes off alright, but once again a little too much Jackson-inspired backstory. Unfortunately, and I say this as one who was hoping for the best, the movie was somewhat forgettable. I just saw it a few days ago, and even now it just collapses into a senseless, 2-hour-40-minute action sequence. I’ve read some reviews that tout this as a ripping, adventure-packed follow-up, and, yes, it is “adventure-packed” but the film rarely stops to take a breath. The characters are running and running and running some more. Quick scene, then back to the running. Let me address some of those misgivings mentioned above. The barrel-riding sequence seemed interminable! Having the dwarves ride in open barrels was the first faux pas in my opinion. Rhett Allain over at Wired has written a great piece about the issues with standing up in floating barrels. I realize they had to be open to do the whole fighting sequence, but they really shouldn’t have. The dwarves, orcs, and elves action-sequence here went from bad to worse. And Bombur with his spinning arms-poking-out-of-the-barrel move was where I really started to just shake my head and sink further down in my seat. When the orcs fell through the ceiling of Bard’s house in Laketown, I just started laughing. That was my true WTF moment! It was all just too farcical. The subsequent fight through Laketown by the orcs, then Bard being chased by the Master’s men, then… it was just all too much. And then we come to the dwarves escapade on the Lonely Mountain. I was with them up for awhile. Even the suspenseful bit with the moon being the “last light” of Durin’s Day worked for me. Thorin’s big old boot saving the key. Nice cinematic touch. Bilbo going down the tunnel, meeting Smaug, the brief interchange between them…. then again… WTF? During the loooooong encounter with Smaug and the dwarves racing around, I kept expecting the score to break into the Benny Hill theme. (aka Yakety Sax). Oh, my, and the whole thing with the forges (I’ll admit it was cool to see the Forges of Erebor lighted up but what came next… shudder). And then trying to drown Smaug in gold??? I realize this was a little homage to Smaug’s epithet as “the Golden” but… really?! That’s how Jackson fits it in? Wired‘s Allain does a great piece about the melting gold, too. The conlangs? Always nice to hear a well-developed conlang in a film but consider this? Why do Legolas and Tauriel seem to constantly switch back and forth between Sindarin and English (presumably meant to equate to Common Speech/Westron)? If they’re just talking between themselves, why not just speak in their first language? Same way with the orcs. Sometimes they use Black Speech/Orkish, sometimes the Common Speech? Pick one and stick with it! 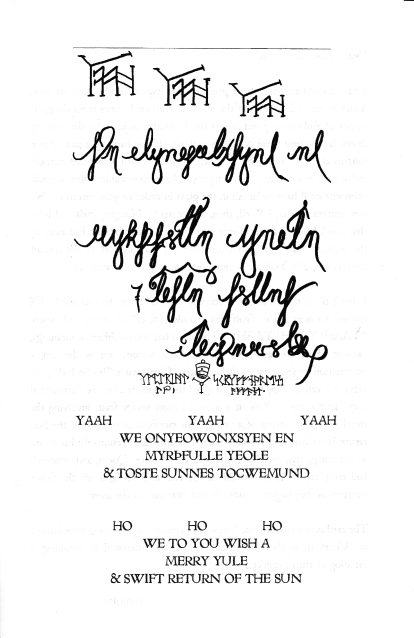 For additional info on the conlangs, check out David Salo’s blog that covers Black Speech, Elvish, Khuzdul, and Orkish. 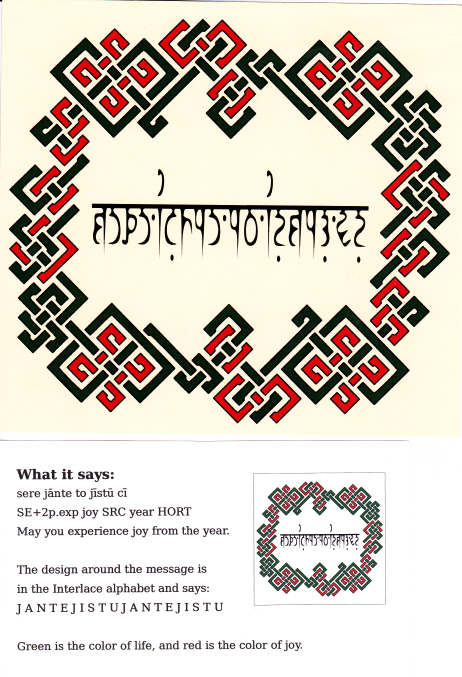 I received my 2nd conlang holiday card in the exchange. 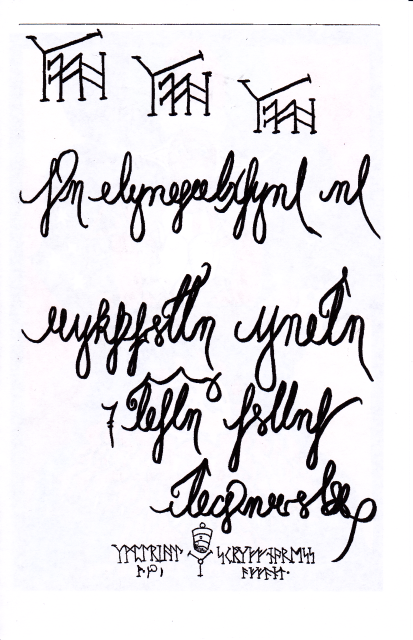 This one is from Padraic Brown, with a conlang and a conculture! 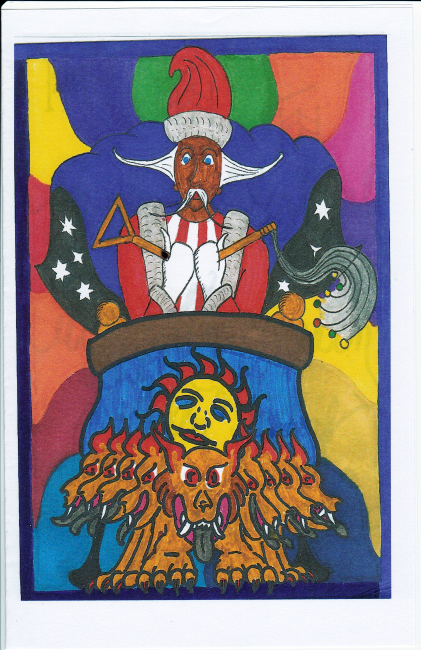 This image includes the card (top) and Sylvia’s explanation (bottom). Unfortunately, the green interlace did not come out as nice as I would have liked on my scan, but, nonetheless, it’s a beautiful design… made even cooler by the fact that the interlace design is a script as well! Kēlen is an inspiration. Thanks, Sylvia! 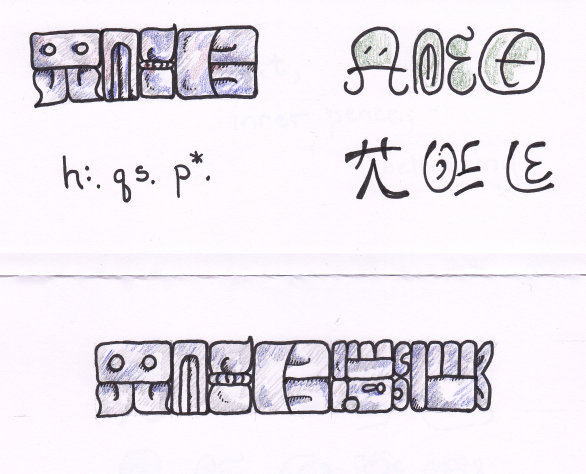 These are written in a new script I’ve been devising for my Drushek language known as Dritok (or r’.z*w. in proper transcription style). 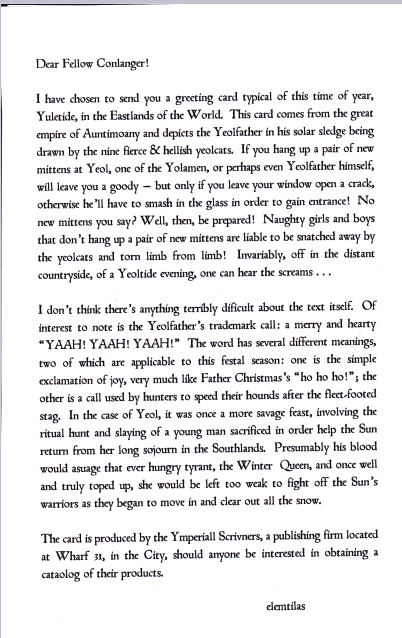 Before the cards, the script had not seen light outside my notebooks, so, tah dah! The word h:.qs.p*. means “contentment, inner peace, restful mind, etc.”. The segment qs. has to do with “mental states.” The top image has the word written in three different scripts. The full phrase on the bottom image is h:.qs.p*.=D4/I1=D2 and means (roughly) “May contentment be within you” (a customary Drushek greeting and farewell). As some may already know, the D4, I1, and D2 are gestures within the language and h:.qs.p*. is vocalized. I’ve been giving Dritok a lot of thought lately and may be posting more to my (woefully under-utilized) Kryslan blog. So, today is Thanksgiving in the U.S. The title of this post is as close as I can come to “Today is Thanksgiving!” in Quenya. Hopefully, it’s correct. Since it’s a holiday and I had some time, I thought I might compose a little shout-out to what I’m appreciative of conlangery-wise (in addition, of course, to being thankful for family, health, and those things I’m thankful for every day). I’m thankful for all the fascinating people I’ve met through conlanging, both those I’ve met personally and all those who’ve ever been ready to share their advice and knowledge through Conlang-L or other venues. Thank you all! I’m thankful (I think “thankful” is an appropriate word) for finding a hobby/craft/art that constantly has new things to learn. I realize that’s true of most hobbies, but this happens to be the one I enjoy. Just when I think I have a handle on some aspect of language, I find another new one to explore (and to humble me). Enjoying the “multifariousness and beauty of language” (to quote The Conlang Manifesto) is one of the great things about conlanging. I’m thankful I have the opportunity to represent the LCS as prime tweeter @fiatlingua (or is that twitterer? ), secretary, and librarian. I recently had the chance to talk with Christine Schreyer‘s class via Skype about the LCS, my exhibit, and some of my conlanging efforts. I’m also writing an article on conlanging for an online magazine. All this came about due to my involvement with the LCS. Happy Conlanging and Alassëa Hantalë!